^ Pollack, Martin. Achmat Ebrahim is the new city manager of Cape Town. 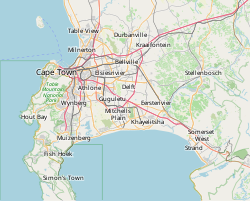 City of Cape Town Metropolitan Municipality. 2006-05-31 [2007-03-25]. （原始内容存档于2007-04-16）. ^ World Weather Information Service – Cape Town. [2010-05-04]. 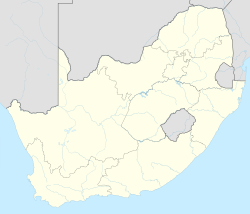 ^ Cape Town/DF Malan Climate Normals 1961–1990. National Oceanic and Atmospheric Administration. [8 April 2013]. ^ Hottest temperature. enca.com. [6 March 2015]. ^ （英文） 開普頓議席分佈 (PDF). 獨立選舉委員會(南非). 2006年. （原始内容 (PDF)存档于2006-03-18）. ^ City of Cape Town: Economic Statistics 互联网档案馆的存檔，存档日期2007-05-20. 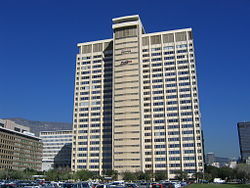 ^ South African Department of Minerals and Energy 互联网档案馆的存檔，存档日期2009-01-03. ^ South African Boatbuilders Business Council 互联网档案馆的存檔，存档日期2017-01-06. ^ Official Western Cape and Cape Town tourism guide 互联网档案馆的存檔，存档日期2007-11-26. ^ Kirstenbosch National Botanical Garden 互联网档案馆的存檔，存档日期2006-08-11.